The Apptivo Expense Reports App is a simple expense management solution available on the web, and on iOS and Android. Employees can records details of their expenses and submit for manager approval. Includes tons of advanced features to streamline the user’s experience, such as capturing expense receipts from mobile phones, or importing them directly from credit cards or bank accounts. Employees using the app will be able to log a new expense from anywhere, including the costs, receipt, tax, and any extra details. The expense can then be submitted right away, or grouped together with other expenses into a report. Expense reports can then be submitted for approval, and then track the process of reimbursing the employee when needed. The app also includes many simple, but powerful configuration tools to implement business policies and processes. Design custom workflows without any programming, including triggering templated emails for key events, and automating complex multi-level approval workflows based on the type of expense or employee. Contains integrated ledger with accounting rules, as well as an integration to export to Quickbooks. Apptivo is a cloud platform containing 50+ business apps, including Expense Reports. Enhance expense tracking by integrating directly with an existing CRM, project management, or invoicing platform, or any of the other Apptivo apps. The entire suite has a connected package of collaboration tools for activity, note, and document management, including integrations with Google apps, and popular email and document storage providers. Very Happy with the product. It works well, year in and year out, and this year, I intend to learn how to use more aspects of it. It's a complete sales CRM and I don't really take advantage of that. I use it as an invoice generation tool. I am a loyal user and have no intention of looking elsewhere. BUT please think about that calendar feature. $60 and an invasive integration from Google, feels a bit much.It is easy and quick to punch out an invoice copying an old customer invoice and making a couple changes in the body the Output looks Professional when I bill my corporate clients. I like that if I get stuck, CHAT is always available and it's been quick to resolve my confusion or concerns. Inconsistent features access between my Ipad and my windows desktop. The IOS (Apple) apps have improved since I started using Apptivo. Although I had to have two separate Apps on my ipad initially and it was confusing, the main app has bulked up to where I rarely need to get on my windows machine. But I'm finding I do have to still, like setting up recurring invoices. Recording payments, seems to be less than intuitive, resulting in me over crediting an account and having to search until I gave up, trying to delete the twice or more extra payments due to some sort of lag from screen to screen. My man complaint is lack of a simple calendar capability and it appears if I want it I'll be having to add Google G Suites, which is overkill. Apparently to make up for lack of feature capability in Apptivo, if I want to set up recurring invoices that utilize date features like 2nd Tuesday of every month or 4th Monday of the month. That will cost me $6 month from Google and I don't want or need all of the G suite features. Sure we are taking all your feedback on enhancing the Recurring Invoices and Calendar capability into consideration and will work on it. I am delighted to read that our support team provided excellent service. We would continue to give all of our customers with the same fantastic experience. You can always get us on online chat (24/7) or write a note to support@apptivo.com. Thank you very much for your kind words! We are working tirelessly to create the best experience for our users, and it's great to see that reflected in your review. We exist because of great customers like yourself! I am sorry to hear about the problems you faced and we are looking into that now. Please feel free to reach out to us (support@apptivo.com) with any thoughts/criticisms/feedback, we would love to hear from you. So, I have been test driving CRM's for the last 2 years. I have scanned and reviewed about 100 of the CRM's out there, and during the selection process only a few stood up to my requirements, being: -A solid sales pipeline (From lead to opportunity to sales to after-sales) -A great contact management system -The possibility to generate quotes that can be converted to work orders, to invoices etc -An integrated templated Project management system with pre-set task generation -Email (gmail) integration -Google apps for business integration -The possibility to add more functionality in the form of integrated apps when the need arises. At the end, and when all the nitty-gritty was tested, only 3 applications remained who were comparable, qua price and functionality. But where Apptivo stands out with head and shoulders above nearly ALL the CRM's I tested, is the quality and the availability of their support! As far as I know, ONLY Apptivo, has a free 24/7/365 online support chat from within the CRM, and I consider this as a huge plus point. I run a small B2B business supplying promotional products mostly in Southern Africa but rapidly growing and expanding our market. We are currently with six people, but I am confident that at our current growth rate, we will pass the 10 employee mark by the end of 2015. I have a deep passion for what I do and when it comes to the integration of a tool that in time becomes a keystone in my business, I need suppliers that share my passion. And this is exactly what the people of Apptivo do: Tested and proven, even today on a Sunday afternoon. Keep up the good work guys, I hope we will go a long way together! Edwin Spiessens Corp. Gifts and Gadgets cc South Africa www.gifts-n-gadgets.co.za Feel free to drop me any question at any time if you think I can help you by selecting a CRM: edwin@giftsngadgets.co.za -A solid sales pipeline (From lead to opportunity to sales to after-sales) -A great contact management system -The possibility to generate quotes that can be converted to work orders, to invoices etc -An integrated templated Project management system with pre-set task generation -Email (gmail) integration -Google apps for business integration -The possibility to add more functionality in the form of integrated apps when the need arises. As far as I know, ONLY Apptivo, has a free 24/7/365 online support chat from within the CRM, and I consider this as a huge plus point. -A solid sales pipeline (From lead to opportunity to sales to after-sales) -A great contact management system -The possibility to generate quotes that can be converted to work orders, to invoices etc -An integrated templated Project management system with pre-set task generation -Email (gmail) integration -Google apps for business integration -The possibility to add more functionality in the form of integrated apps when the need arises. As far as I know, ONLY Apptivo, has a free 24/7/365 online support chat from within the CRM, and I consider this as a huge plus point. Our business started Apptivo when we were quite small, and there were several issues with the program when we first began using them. The support at Apptivo is awesome, every time that we have a difficulty using any of the programs feature, they have gotten back to us within hours or sometimes days. The recent issue with using their Ledger App took a bit longer to resolve but we enthusiastically appreciate their dedication to resolving the issues, and how thoroughly they did resolve it. The features we use most often include: Emailing Invoices and Estimates, keeping track of our Finances with their Ledger App, and keeping track of correspondence with Clients. There are some many other features to the program including tracking Inventory, tracking Accounts with Suppliers, and creating Projects with clients/collaborations with other professionals just to name a few. I will continue to use and support the Apptivo program. They continue to grow and offer more features, clearer and efficient options for tracking the growth of our business as it continues to grow!Easy to use features - Sending out invoices - Receiving payments and notifications - Receving Emails and Client feedback - Tracking client info - Reviewing, Updating, and tracking Inventory and Accounts Payables. There are many other features but these we use in general. Get the Expense Reports App starting at $10/user/month. 50+ apps included in all plans. All plans include free 30-day trial. No per-app pricing or add-ons. Employees can access Apptivo Expense Report on their mobile device, take photos of receipts and submit expenses on the go. Apptivo Expense Report connects with all major banks and credit providers. Submitted expense reports are instantly routed according to predefined business rules. Apptivo's reimbursement tracking means that eligible pending expense reports can be viewed at any time, with notifications sent as they're approved. Apptivo Expense Report supports multi-currencies and is able to define and enforce tax laws and conversion rates. Expenses can be recorded against any project, customer, opportunity or contact with Apptivo. Apptivo Expense Report is customizable for individual business needs. Below are some frequently asked questions for Apptivo Expense Reports. Q. What type of pricing plans does Apptivo Expense Reports offer? Q. 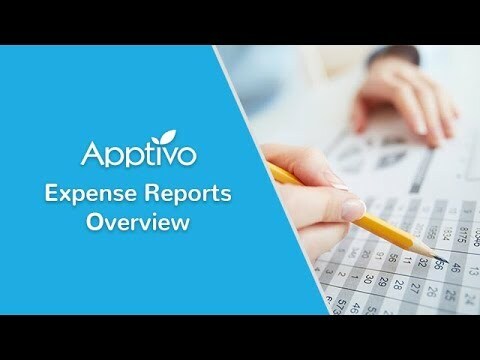 Who are the typical users of Apptivo Expense Reports? Q. What languages does Apptivo Expense Reports support? Q. Does Apptivo Expense Reports support mobile devices? Q. Does Apptivo Expense Reports offer an API? Yes, Apptivo Expense Reports has an API available for use. Q. What other apps does Apptivo Expense Reports integrate with? Q. What level of support does Apptivo Expense Reports offer? Q. Which apps is Apptivo Expense Reports compared to most often?